The Human Rights Foundation of Turkey (HRFT), was established in 1990, is a non-governmental and non-profit organization providing treatment and rehabilitation services for torture survivors and documenting human rights violations in Turkey. The HRFT grew out of the necessity to further promote the prevention of torture in Turkey where grave human rights violations left thousands of people tortured and traumatized. The establishment process of the HRFT was launched by the Human Rights Association together with the Turkish Medical Association and founded in accordance with the Turkish Civil Code. 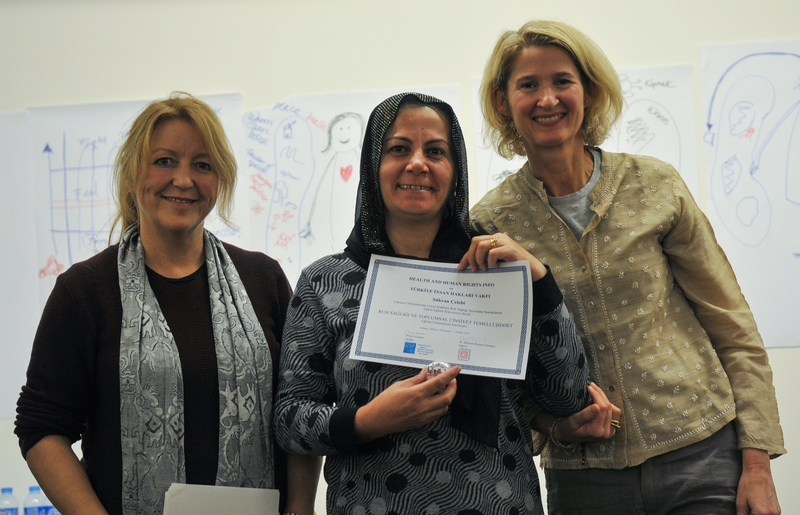 A good deal of work has been done to address gender-based violence in Turkey. However, recent studies suggest that the problem remains widespread. According to a national study, ‘Domestic Violence against Women in Turkey’, published in January 2009 by the Directorate General on the Status of Women (KSGM), the rate of physical violence against women is 38 per cent in cities and 43 per cent in rural areas. The problem is compounded by a lack of education and opportunity. About 56 per cent of the women who reported abuse have no education. National media campaigns have brought more visibility to gender-based violence, but for many women, the problem remains locked behind closed doors. Nearly half the women in the study who experienced violence said they had never revealed the problem to anyone. One in three women reported that they had considered suicide at some point in their lives because of the abuse. The endemic nature of violence is due in part to a collective ideology about gender-based violence. Close to 14 per cent of women said it was sometimes acceptable for a husband to beat his wife, and 49 per cent of women who had been abused did not seek help because they did not believe it was a problem (UNFPA – Partnering with men to end violence 2009). HRFT has five branches in Turkey providing treatment and rehabilitation to torture survivors. One of these branches is located in Adana. Adana is one of the cities where most of the Kurdish people had to migrate during 1990’s in a process of forcefully displacement. Moreover there is a angible population of ex-inmates of political crimes, torture survivors and their relatives, related to the on-going conflict in Turkey. One of the neighbourhood cities is Mersin which can also be defined in the similar sociocultural context like Adana. Antakya is another city close to Adana that as a border to Syria. In these two years Antakya has been one main centre for Syrian refugees and has lots of issues regarding the conflict in Syria. Taking into consideration all these circumstances, HRFT proposed to have the training in Adana. By the courtesy of our colleagues working at HRFT Adana Branch, the organisations working in the field of human rights were invited to the training. The 3 day training commenced with an introduction of the participants, expectations for the training and the Manual. One of the trainers from HRFT, Şahika Yüksel presented the key aspects of gender based violence with a human rights perspective. Following the presentation, the other trainers Katinka Salvesen and Lovise Angen Krogstad made remarks on trauma in relation to gender-based violence and in order to assess the current situation of the applicants to the participant organizations, working groups were formed. Following the evaluation of the indicators the use of metaphors in trauma treatment was expressed and by the end of the day participants were introduced with “butterfly woman”. The significant techniques which can help “a good helper” while dealing with trauma survivors were also introduced in this session. The importances of respect, willingness to help and listen were clarified by the courtesy of participatory exercises. Second day was dedicated to the usage of butterfly woman while assisting survivors. As the metaphor enables the survivor to distance herself, the healing paths out of trauma, the expected reactions and symptoms of trauma were expressed through the understanding of butterfly woman. Also the grounding techniques gave all the participants an opportunity to stabilize the survivor and assist in a condition where survivor has reactions, triggers and re-traumatization. By the courtesy of role-play participants practiced how to use their senses to regulate responses in the body, thoughts, breathing, feelings and heart. Assisting a survivor during the reporting process was handled through role-play on the last day. The stabilization techniques were repeated in such triggering situations which also resort to nightmares and troubled sleep. We paid significant attention to integrate participants from organisations that focus on gender based violence. But it was also important for us to have the collaboration of a wide range of participants who conduct work on conflict resort to human rights violations. Initially, twenty people (17 women, 3 men) agreed to participate in the training. Apart from HRFT (9 people), there were 3 women from Adana Solidarity Association For Prisoners’ and Convicts’ Families which focus on the prisoners’ rights and counsel the relatives of inmates. They conduct works with Mothers for Peace and focus on the armed conflict in the country. Ishtar Women Centre had 3 representatives. It is a local woman organization under the umbrella of Akdeniz Municipality in Mersin province, providing health services and social counseling to women and children. There were 2 women working for The Social Assistance and Culture Association of Migrants or Displaced People which was founded in 2004 in Mersin, They focus on the victims of forced migration. They have been conducting projects on Basic Health Services Training and Counseling, Women’s Psycho-Social Counseling, Social Justice for Internally Displaced Persons. And Human Rights Association Mersin Branch had 2 participants. Human Rights Association works on all kind of human rights violations, but is mainly focused on abuses in Turkey. Also the chairperson of Human Rights Association Antakya Branch participated to the training, who is a lawyer and has experiences on both gender based violence and problems of refugees. Before the training all participants were informed about the draft agenda via email. Participants described the training as a very helpful tool to have an understanding of interview techniques, to meet with new kind of training methodologies (role-play), to define the existing tools while assisting survivors in a scientific approach. As most of the participants are also subjected to violations themselves, they had a chance to meet with their on-going traumas. Most of the participants expressed the situation as “we can’t be good helpers if we don’t help ourselves”. So they made remarks on how this training encouraged them to use grounding exercises, and to use senses. All participants agree on that Turkish version of manual will be appreciated. As a whole, the training motivated all organisations to have a “care programme for helpers”, to use the manual and techniques while assisting to survivors. In response to the feedback from the participants, the content of the manual focused even more on helping the helper. In addition to elaborate even more on the chapter discussing reporting and being aware of local law and being sensitive for local tradition.